Clear, bright light streams in through the kitchen window, past the sink and drying dishes, onto the tile floor. We continue through the next room, admiring high ceilings. There is little furniture, so each room feels open and spacious. Finally, we sit together in a bright back room that is lined with floor mats for sitting. There is tea and bowls heaped high with fruit—two kinds of grapes, two kinds of plums. There is conversation about kids starting school, and their oldest son marrying soon. “The neighbours here are so kind with us. They are so helpful,” they say. My friend Gozê sits on the mat beside me. She plucks green grapes, a few at a time, from the bowl in front of us. She is the same woman we have known for years, since a few months after ISIS devastated their lives. She is the same woman who made a home for her family out of a dark shipping container and an attached tent in the middle of a muddy field; who carved out precious space devoted to making bars of Sisterhood Soap. We have known Gozê for a few years now, but in this house they are now renting, it feels like we are meeting her for the very first time. Often, the hardest part of being a refugee isn’t losing your home or your livelihood. It’s the overpowering sense of shame—undeserved, but real all the same. It’s the shame you feel living in a makeshift home. The shame of having to surrender your sovereignty to the confines of a refugee camp. The shame of being forced to rely on handouts to survive. This is what it feels like when you’re at the lowest point of your life. Our first interactions with displaced families often happen when they’re at their lowest point: Houston families piling soggy possessions high at the side of the road after Hurricane Harvey. Fallujah families staggering into tents, hungry and thirsty after escaping ISIS. Mosul families with torn, blistered feet from fleeing barefoot on blazing hot roads and rubble. A little while later, when we sit down with families to discuss starting a business and investing in their future, they are a little more stable. They have a temporary home, whether it’s a shipping container in a muddy field like Gozê’s, or a few rooms in a refugee camp. Wherever they are living, they try to make it more livable by whatever means they have. But when we visit, once again there is a lot of shame present, like an unwelcome guest. Families are embarrassed for us to see them in such rough conditions, in a house that is not their own, with bits of broken furniture gathered off roadsides. Our task isn’t merely to help refugees rebuild. It’s to help them throw off that sense of shame, so they can be who they truly are. Sisterhood and Kinsman Soap have allowed us to be involved in families’ lives over a long period of time. We met the soapmakers’ families when they had little means. But over time, soap has become a tool helping displaced families gain new ground. Now we are sitting in Gozê’s rental house, and it is thrilling. 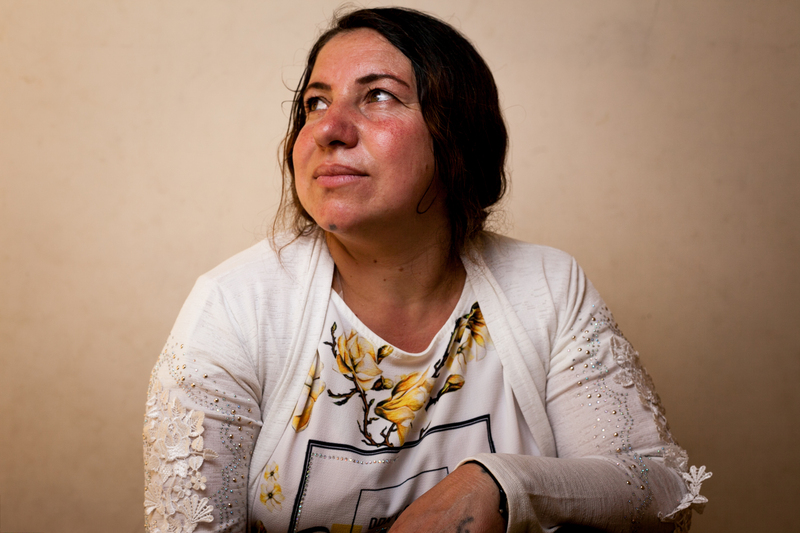 She isn’t “home” yet—her family haven’t been able to move back to the city they fled three years ago, when ISIS attacked. But they are another step closer. The profits Gozê earns making soap has allowed her to throw off shame, and stand tall. She is coming back into the person she was, and growing beyond. We love Gozê. We love her family. And we are so excited to see how the next chapter in her life unfolds. Empower refugees to throw off shame and rebuild their lives.